The Super Bowl is coming up on Sunday, February 5th. And that means parties! Looking for ideas on what to serve? We’ve got you covered. We’ve assembled some of our favorite football-friendly recipes. And we’ve just scratched the surface. You can find lots more in our Recipe Index. So let’s get started. No need to flip a coin. Artichoke Dip with Cheddar Cheese. 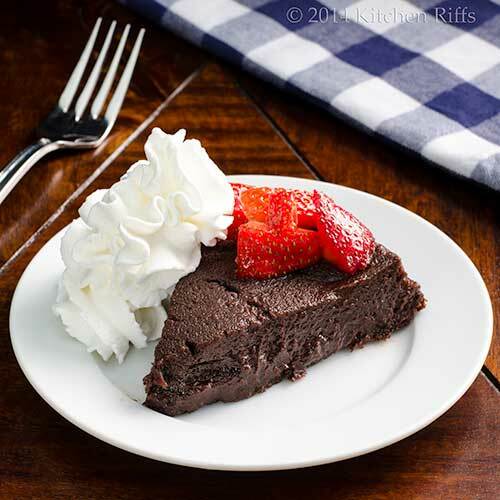 Tangy and no-bake, this is easy – and super tasty. Candied Bacon. Because bacon. These go fast, so you might want to make a double batch. Easy Cheese Straws. Better by far than any cheese-flavored snack you can buy in a box. 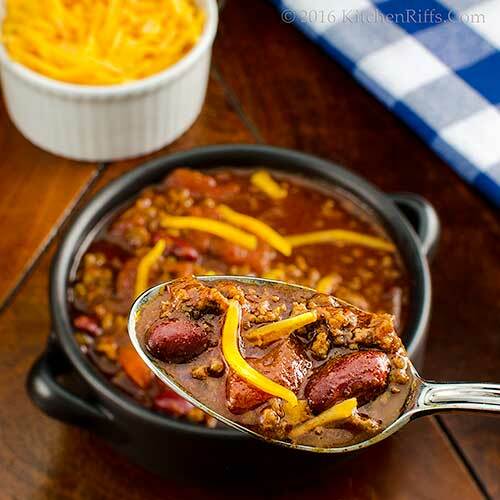 Slow Cooker Homestyle Chili. Easy – and just like mom used to make. Texas-Style Chili con Carne. A meat-based classic. Vegetarian Chili. Because not everyone eats meat. Green Chile Stew with Pork. Meat and potatoes, New Mexico style. Oven Slow-Cooked BBQ Beef Brisket. Outdoor flavor cooked indoors. Oven Slow-Cooked BBQ Pulled Pork. Who doesn’t love pulled pork? Slow Cooker BBQ Pulled Pork. Easy recipe, irresistible flavor. Oven Slow-Cooked BBQ Spare Ribs. Low heat is the secret to tender succulence. Grilled Bratwurst. Because what’s football without a brat fry? Tex-Mex Shredded-Beef Enchiladas. Red chile sauce and melted cheese liven up this classic dish. Bacon Macaroni and Cheese. An old favorite gets even more savory. Green Chile Cauliflower ‘n Cheese. A trimmed down, kicked up twist on mac ‘n cheese. Tuna Pasta Salad. Simple comfort food (on the healthier side). Boca Negra Cake. For serious chocolate lovers. Chocolate Mascarpone Brownies. So addictive they need a warning label. Lemon Cheesecake with Walnut Crust. Mascarpone amps up this gluten-free delight. Chocolate Chip Bars. Even better than chocolate chip cookies. Chocolate Fudge with Nutella. Marshmallows add oomph to this easy microwave fudge. Double Orange Dark Chocolate Cookies. A classic flavor combo. Grape Flaugnarde (Flan). An elegant (but light and easy) French dessert. Peanut Butter Cookies. For the kid in all of us. Rich and Easy Bread Pudding. Eggy goodness lurks beneath a crisp crust. Sweet Potato Pie with Walnut Crust. Deep flavor, no gluten. Walnut Roll Cake. Rich, delicious, and gluten free. Such indulgence! I love peanut butter cookies. Oh, that bacon! Holy cow (or pig as the case may be)! I am drooling over that candied bacon!!! Awesome list John! I normally enjoy my friend's party but if I had to host one I'd definitely try some of the recipes from each section. Thanks for sharing! Hi Mae, peanut butter cookies are great! Always like them as a kid, and still do. :-) Thanks for the comment. Hi Lydia, that candied bacon is wonderful! SO worth making. :-) Thanks for the comment. Hi Angie, it's really good stuff! :-) Thanks for the comment. Hi Yi, it's fun hosting a Super Bowl party, but even better going to one at a friend's house. Less work! :D Thanks for the comment. Great collection John. Thanks for sharing. 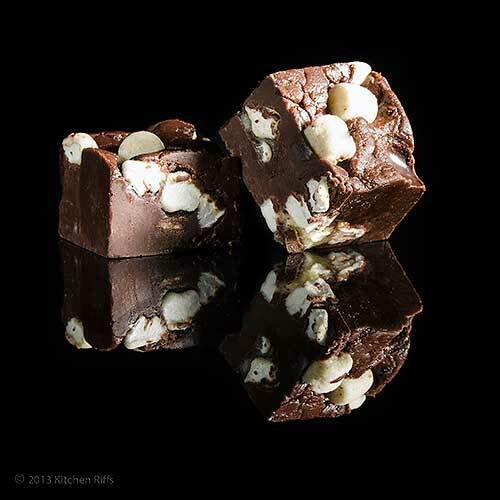 Those desserts all sound good, but that fudge looks awesome and there's something so approachable about good fudge. Well my goodness! What a round up! Those Chocolate Chip Bars are scrumptious! I haven't kept up with football this year. But I will attend any Super Bowl party for food. That candied bacon has my name on it. Hi Amira, so many dishes, just one game . . . :-) Thanks for the comment. Hi Laura, microwave fudge is wonderful stuff. And so easy to make! It's addictive. :-) Thanks for the comment. Hi Judy, peanut butter cookies and candied bacon sound like a terrific lunch! :-) Thanks for the comment. Hi Deb, the chocolate chip bars are awesome! We don't make chocolate chip cookies anymore -- just the bars. They're that good. :-) Thanks for the comment. Hi Ansh, we have followed football at all closely this year, either, but SB parties are always fun. Particularly when there's bacon involved. :-) Thanks for the comment. Hi Greg, it does! It's world class (if I'm allowed to say that these days!) :D Thanks for the comment. What a delicious collection of recipes. I am eying the slow cooker chili and the shrimp dip. Thanks for all those recipes. Hi Gerlinde, the shrimp dip is a bit different and really good. Well, the chili is too, but the dip is fun! Thanks for the comment. Damn Man! I'm comin' to your house! What a spread! Not a football fan but I would go to a party just to eat all these dishes! 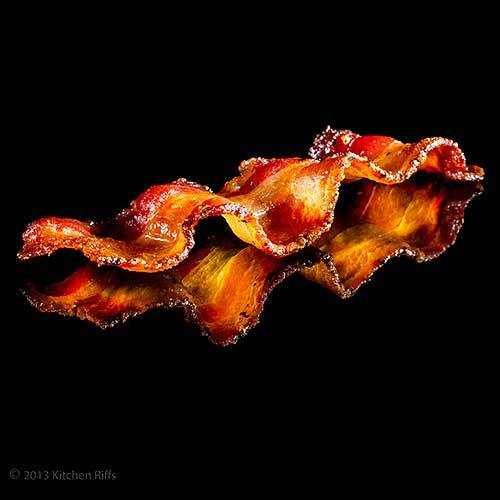 Seriously, that shot of the candied bacon, sexiest pic ever! What a line up! Your game recipe collection is better than any match line up but I hope your favourite team wins. Candied bacon ... I am sure that will go well with fried eggs for a great Australia Day breakfast �� thank you John. Hi Abbe, you'd be most welcome! :-) Thanks for the comment. Hi Evelyne, that's a fun picture, isn't it? Great dish, too! Thanks for the comment. Hi Pam, the Boca Negra Cake is SUPERB! Mrs KR makes it all the time for company. MRS KR developed a gluten-free version of it that we need to post -- incredibly, it's actually a bit better than this version! Thanks for the comment. Hi Pat, that's really good fudge! Thanks for the comment. Hi Tricia, the crab rangoon recipe is different, and really fun. :-) Thanks for the comment. Hi Merryn, love the idea of candied bacon for an Australian Day breakfast! Make loads -- people will want seconds. And thirds. :-) Thanks for the comment. Hi John, something for everyone here, from sweet to savory. my husband would go crazy for the bacon. Hi Cheri, that bacon is always a favorite of many people whenever we serve it! Thanks for the comment. What time shall we be there? :) Great line up John. Hi Lea Ann, :-) Thanks for the comment. Wow, look at all these yummy suggestions. I love all the hearty comfort food for the Super Bowl and then after that, I get serious Spring fever. I can already feel it coming! Your photos are always so appetizing, John, and your recipes so flavourful and mouthwatering. Great collection! Hi Robyn, we've been really digging hearty comfort food, but we're starting to switch appetite gears, too. Spring is just around the corner! Thanks for the comment. Hi Liz, that bacon is awesome stuff! Thanks for the comment. Hi Anu, that fudge is wonderful! And really easy to make -- my favorite kind of recipe. :-) Thanks for the comment. Everything in this round up sounds so delicious! Yum! I think we can all agree that Super Bowl food is the best kind of food out there! Love that shrimp toast dip! Hi Karen, you should! :-) Thanks for the comment. Hi Peachy, lotta good stuff here! Thanks for the comment. Hi Ashley, Super Bowl food is fun, isn't it? And tasty! Thanks for the comment. I MIGHT wind up being the ONLY PERSON who doesn't watch the superbowl - hahahahaha! Hi GiGi, well, you'd be in excellent company. :-) Thanks for the comment. Your timing was perfect! Today we received an invitation to a SB party potluck and was about ready to start looking for ideas. Thanks for the great list!! Hi MJ, your worries are over! Now all you have to do is make one of these dishes. :D Thanks for the comment. Good Lord, what a list! I have always wanted to make candied bacon, and remember having seenit on your blog. Thanks for reminding me! Hi Jeff, you will LOVE the candied bacon! Really. Good. Stuff. :-) Thanks for the comment. Great round-up. The Green Chile Stew with Pork sounds especially tasty to me. Hi Pam, that's a good dish! Nice and spicy. :-) Thanks for the comment. Such a terrific roundup---something for everyone. Now that the Packers are out, we ca actually watch the game without the family getting too stressed out. Means half time snacks are welcome! Hi Liz, I think most people who don't have their team in the game find the food the most interesting thing about the SB. We do! :-) Thanks for the comment. A real prize to celebrate the super bowl... and great additional ideas to make it even more special. Hi Denise, with these dishes, fun will be had by all. :D Thanks for the comment. There's some great eating listed here. You know, some people think it's funny that being such as "gourmet" I like onion dip, but I really do. My guilty pleasure, I guess. I'll try it next time with clams, sounds delicious! Hi Frank, we like that onion dip too, junky dried commercial soup and all! Guilty pleasure are fun, aren't they? :-) Thanks for the comment. John, I'm just dashing out the door, but I'm coming back later to go through your list thoroughly! I better do it *after* lunch though because it's going to make me hungry! Hi Jean, yup, definitely read this after lunch -- loads of hunger-inducing links here. :-) Thanks for the comment. We're having two couples in for Super Bowl. I hadn't thought about making cheese straws but I just love your recipe, so it's definitely going on my menu. Thanks for the round up John, it's so handy. Hi Eva, cheese straws are wonderful! Super flavor fit for, well, the Super Bowl. :-) Thanks for the comment. Hi Carolyn, nothing like a little indulgence from time to time, is there? :-) Thanks for the comment. Hi Juliana, that cheese dip is really junky, but really addictive. :-) Thanks for the comment. I'll be over to watch it with you guys and enjoy all this tasty food ;-)! Hi Amy, you'd be welcome! :-) Thanks for the comment. John, I think you need to have that bacon photo printed framed and mounted on your kitchen wall. A piece of art! Thanks for the fun round up, a little something for everyone. Hi Raymund, definitely a champion line up! :-) Thanks for the comment. Hi Bobbi, that bacon was a lot of fun to photograph. :-) Thanks for the comment. I love appetizers above all else and now I'm dying. I haven't had dinner yet so I'm starving and now nothing will measure up. All your fault...great roundup! Hi Barbara, I think I could make a whole meal on appetizers. And, well, have actually done so in the past. :-) Thanks for the comment.